A month ago I was planning to find a new home for this WIP. I was convinced that there was no way I would ever finish the beaded border. It's Susan Pandorf's Evenstar pattern, which calls for 56 repeats of a 20-row knitted-on border chart, and each repeat uses 50 beads. I worked on it for several miserable days in February 2011 (admittedly, I was recovering from a very bad case of bronchitis, which didn't help). I repeatedly dropped beads, dropped stitches, and shredded the yarn, accomplished a little more than 3 repeats, and stuffed the whole thing in a bag in The Closet of Despair™. Five days ago, I liberated it. It was so beautiful that I thought I'd give it one more try before giving it away. As of this morning, I've completed 30 repeats, more than half the border. In short, I've got better tools and more experience. 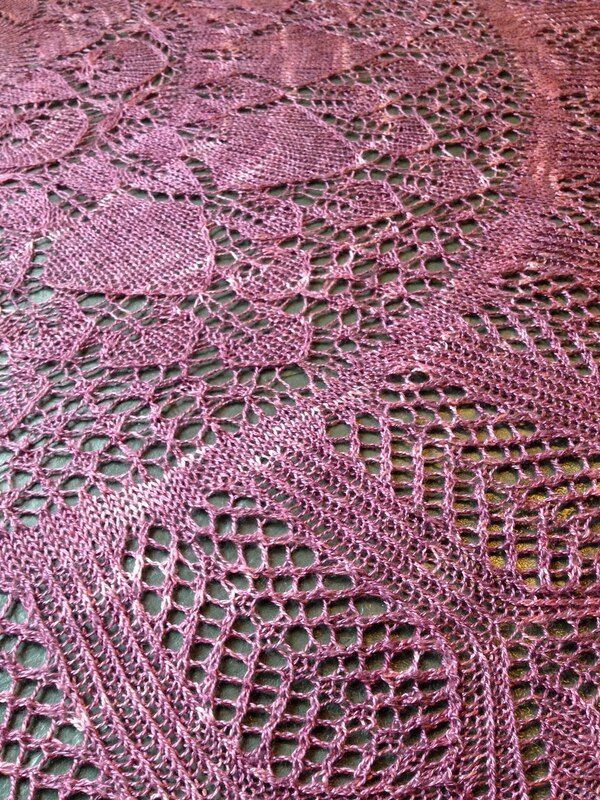 I knit the entire body of the shawl on Addi Turbos-- not the Lace Addis, either, but the regular ones, with their fairly short, rounded tips. Now I've got Red Lace ChiaoGoos (which I'm not sure even existed in February 2011). Not only do they make working the decreases easier (how did I ever slog through all those twisted double decreases in the body without them? 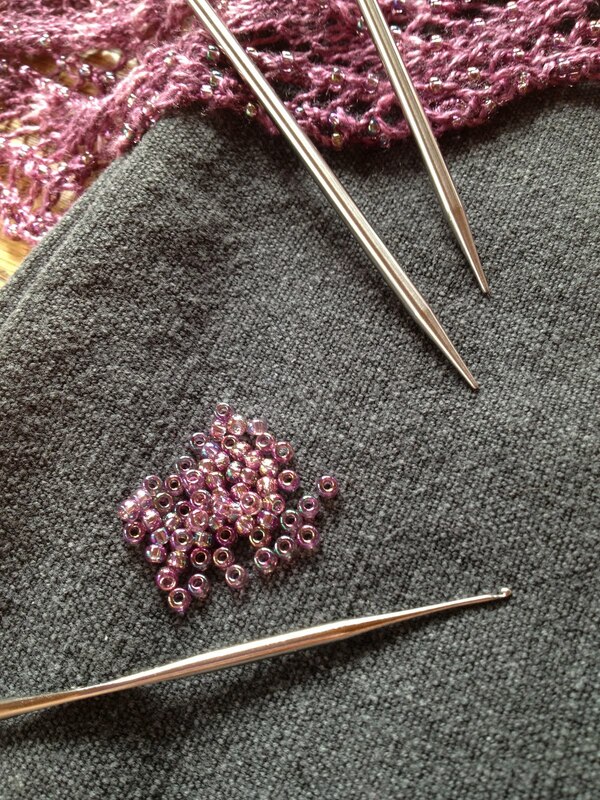 ), but those pointy points really make transferring the stitch back to the needle from the crochet hook simple. The crochet hook I was using before was too small for the job, so tiny that that the silk thread didn't really fit in the notch, hence the shredding. The one I'm using now is twice as big (1.0 mm instead of .50 mm), yet still fits through nearly every one of the size 8 beads. 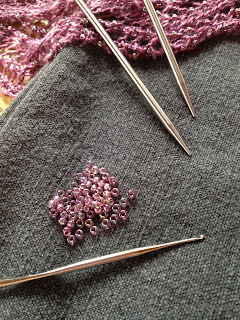 Even having the beads on a "bead mat" (in my case, a clean dinner napkin) instead of in a bowl or a tin keeps them from rolling around while loading the crochet hook. And since I've had more beading practice since then, I can pick up several at a time instead of having to load each bead on the hook individually. I often tell my students that there's not really any such thing as a project that's too hard, but sometimes a project is too soon. Maybe I should try listening to myself occasionally. I am guilty of this as well. 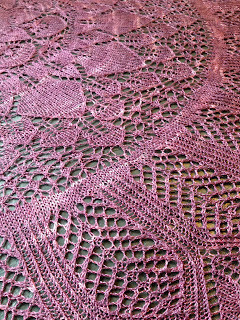 I started a lace shawl in 2006 and it was very much above my current skill level at the time. I couldn't read my knitting very well in thinner yarns, I didn't know anything about lifelines or keeping track of my place in charts; it was a mess. I've taken it out periodically and it's ended up back in the closet, or frogged and restarted. But eventually you learn what you need to know to get it done. I frogged the whole thing again this summer, washed and rewound the yarn, and I'm making excellent progress with no issues this time around.